CIMBA recognizes that the people inside your company are your most valuable resource. In this challenging global economy, it is important to fill skill gaps so your company can maximize today’s opportunities and be prepared to meet tomorrow’s challenges. CIMBA’s in-company, custom, executive education programs are a sound investment in your human capital. CIMBA will work with you to create a custom executive education program that meets your company’s exact needs. After one of our experts conducts a thorough needs assessment, we will help you determine the best topics and training approach for your employees. We can modify an “off-the-shelf” course or create a completely customized program specifically targeted to your needs. Determine the learning delivery that most effectively blends the classroom and experiential learning opportunities for greater retention. You may choose to use either our classroom facilities on our campus in Paderno del Grappa, or our expert trainers or professors will come to you. Whether our custom learning initiatives focus on strategic alignment, leadership development, change management, Six Sigma or any other area of performance, the CIMBA outcome is certain: participants will emerge as better, more effective, thinkers and thereby increase your company’s productivity. 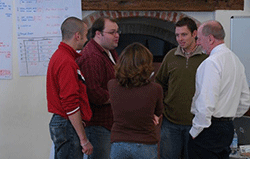 Typical in-company trainings are listed in Quicklinks. CIMBA also offers a number of short courses that can be tailored for your company’s specific needs. No matter if you have an interest in a topic listed or a different need, please contact our experienced executive education team to discuss how CIMBA In-Company Trainings can meet the needs of your organization. To talk with a CIMBA staff member about how our In-Company Trainings can help your company, contact us at executive@cimbaitaly.com or call +39-0423-932120.